This premiere festival is free and open to the public. We are fundraising to promote cultural exchange and diplomacy! 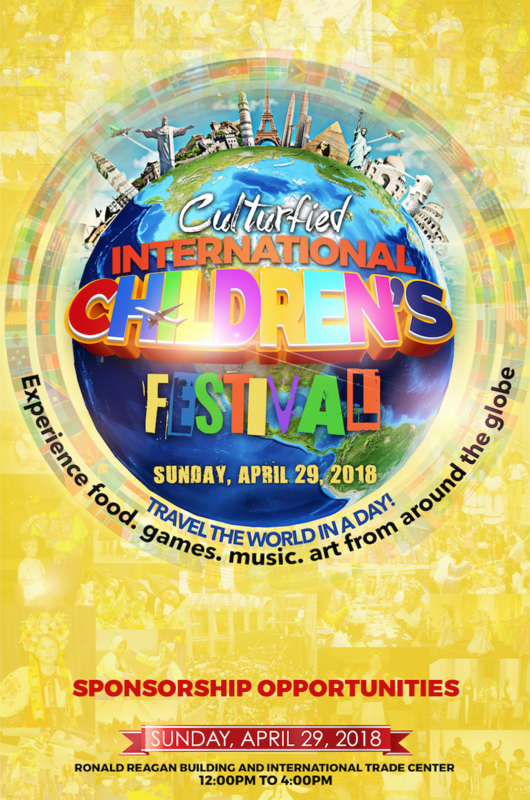 The Culturfied Foundation is excited to present The International Children's Festival at the Ronald Reagan Building and International Trade Center on Sunday, April 29, 2018 from 12:00PM to 4:00PM. This premiere festival is a one-day, interactive, educational event that is free of cost and open to the public. families by inviting them on stage for interactive lessons. I support interaction of children culturally. Keep up the great work Mele. You are an inspiration to many! Happy to support you Mele! So proud of you. The Girmai family are looking so forward to the International Children Festival. Happy to help a great cause. Thanks to Mele Melton for bringing this to my attention. #IamCulturfied. This is awesome and happy to support! Ingenious Financial is a proud supporter of The Culturfied International Children's Festival! Lilly and T Girmai are so proud of you Mele! You get it. Thanks for making the world a better place. We love Culturfied and it's aims for the world, so glad to be part of this!! JMA Solutions congratulates Culturfied Foundation on a successful launch of the Culturfied International Children's Festival! Jefferson Consortium Group is a proud supporter of The Culturfied International Children's Festival! Lavern Chatman is a proud supporter The Cultured the International Children’s Festival launch! Alvin and Vanessa congratulates the Culturfied Foundation on a successful launch of the Children's Festival!